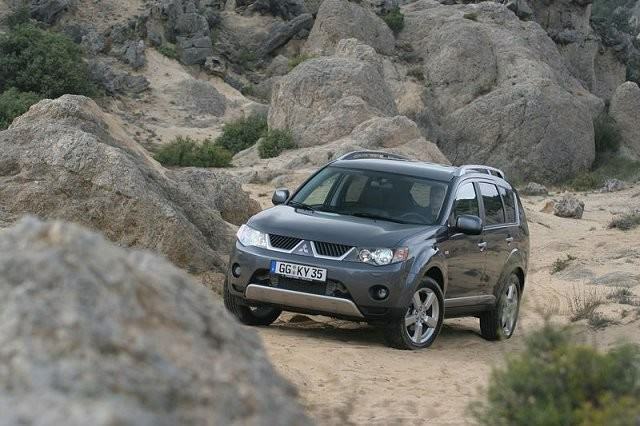 Replacing the small-selling original in 2007 this second-generation Outlander was far better suited to European tastes. You could be forgiven for thinking this is the first of Mitsubishi’s Outlander models, but it’s actually the second. Replacing the small-selling original in 2007 this second-generation Outlander was far better suited to European tastes - so much so Mitsubishi built versions for Peugeot and Citroen (badged the 4007 and C-Crosser respectively). Throw in a 2.0-litre turbodiesel engine borrowed from Volkswagen, seven-seat availability, a split tailgate and respectable driving dynamics and it’s not surprising that the Outlander was relatively successful for Mitsubishi in Ireland. Based on the platform of the Mitsubishi Lancer the Outlander adds space and height over its saloon relative. Indeed, space is one of the Outlander’s main draws, Mitsubishi using the available room cleverly to make the Outlander rival larger SUVs for practicality. Usually a five-seater, there are - on all but commercial models - a pair of additional rear seats stowed neatly in the boot floor, neatly integrated so as not to encroach too much on boot space. Folded up they add additional seating for a pair of children - or supple adults - though using them does obviously significantly reduce the load space. Specification levels are generous across the entire line-up, with even the entry models coming with air conditioning and alloy wheels. Intense and Invite versions are offered in Ireland, both largely similar in equipment levels, so buy on condition and age if you’ve got the choice. The four-wheel drive system is simplicity itself, the Outlander usually running in front-wheel drive mode, an auto setting allowing it to switch to four-wheel drive if needed, or, if you’re in rougher terrain, 4x4 lock is possible, and the Outlander is actually quite an accomplished off-roader. Switching between the modes is done via a small dial in the transmission tunnel between the driver and front passenger seats. Like the exterior styling the interior is neat, though the plastics lack the sort of quality feel of some European rivals - but should prove hard wearing. The 2.0-litre DI-D turbodiesel isn’t the most refined engine out there, but it makes up for that with ample performance, the 140hp it offers backed with a useful 310Nm of torque from just 1,750rpm. Later 2011 cars saw a facelift incorporating Mitsubishi’s ‘Jet Fighter’ grille and new headlamps, as well as a 2.2-litre DI-D engine, its output swelling to 156hp and being offered in both manual and automatic guises. Take your pick from either the well specified Invite model, or the even better specified Intense, both readily available in 2.0 DI-D pre-facelifted (2011) guise. The earlier cars make more sense, and are arguably the better looking - and certainly better value offerings. An often overlooked contender in the compact SUV category, the Outlander’s breadth of ability makes for an appealing used buy. Spacious, well equipped and decent to drive, only a slightly noisy diesel engine and hard plastic interior let it down. Only slightly though, as the Outlander is a useful, almost certainly reliable and practical family, or working machine.